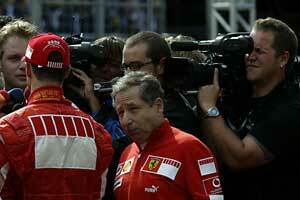 Ferrari team boss Jean Todt has been promoted to the position of a Grand Officier of the Legion d'Honneur. This is France's second highest honour and Todt is now one of only 250 Grand Officiers in France. The next step - if he one day makes it - is to become a holder of the Grand Cross, open only to 75 people at any given point. Among the others who were listed in the New Year Legion d'Honneur "promotion" was Sebastien Loeb, the three-time World Rally Champion, who was made a chevalier de la Legion d'Honneur, the lowest of the five classes.